Research Now Links Depletion of Magnesium to Heart Disease, Diabetes, Alzheimer’s, Fatigue, and 52 Other Conditions and Most Americans Don’t Get Nearly Enough . . .
Of course, the highest concentrations of magnesium in the body are found in the heart and brain, so it’s little wonder that magnesium depletion leads to problems in these two vital organs. There are many reasons for becoming depleted in magnesium: diets high in processed foods, magnesium-depleted soil, certain medication interactions, and fluoridated water, which renders magnesium unavailable to the body. Chronic stress elevates the stress hormone adrenaline, which further depletes magnesium. Last but not least, aging is a risk factor for magnesium deficiency. And in a vicious circle, accelerated aging is also a byproduct of magnesium deficiency. Magnesium performs hundreds of functions in the body; however, many researchers believe its most important function is cellular energy production. The enzyme ATP, created in the mitochondria of each body cell, is our main source of cellular energy. ATP must be bound to a magnesium ion in order to be biologically active. 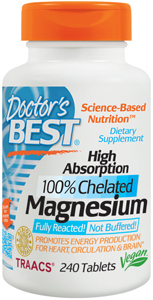 Unfortunately, most people just don’t have enough magnesium ions available.